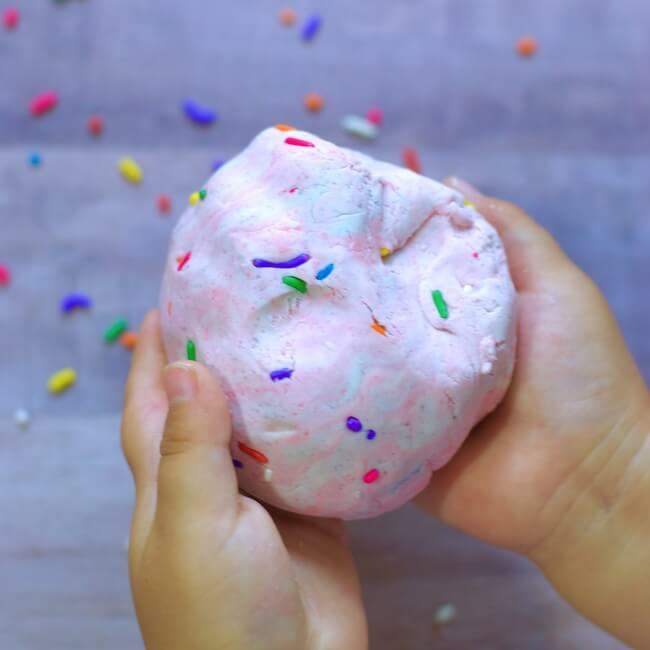 This colorful, scented, edible, all-around amazing Unicorn Poop Play Dough recipe is a sensory play experience that your kids will love! 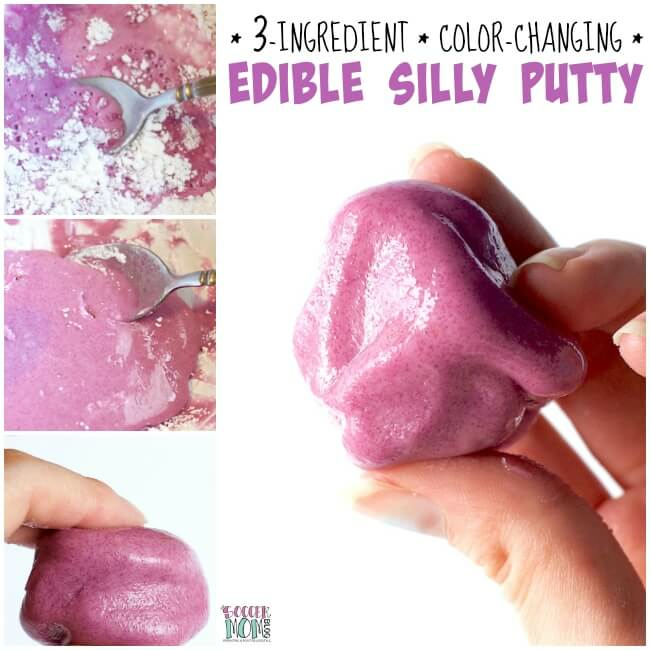 Last week we made Birthday Cake Batter Edible Play Dough. That was fun and all, but today we took it one step further…unicorn style!! 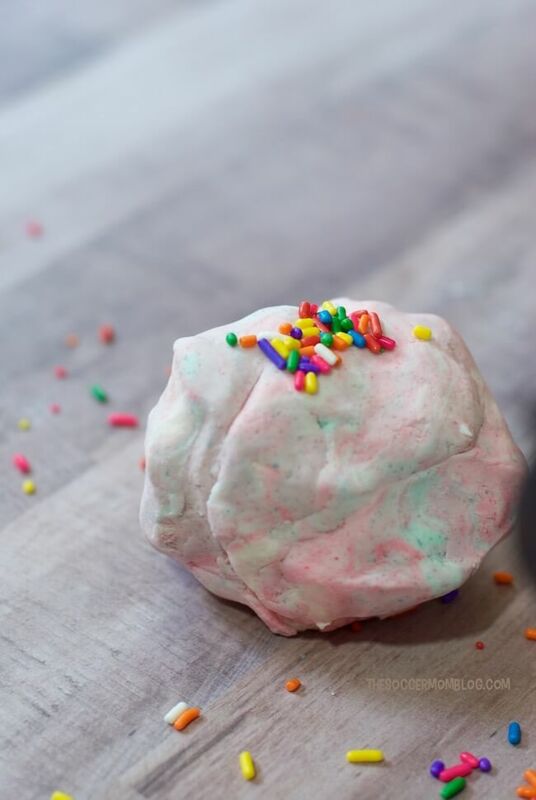 This Unicorn Poop Play Dough is a treat for all your senses! We start with a soft, malleable dough that smells just like birthday cake batter. Then we add a rainbow of vibrant colors and scents to make it even more awesome. And then we top it all with sprinkles! Because sprinkles make everything better! Love unicorns? 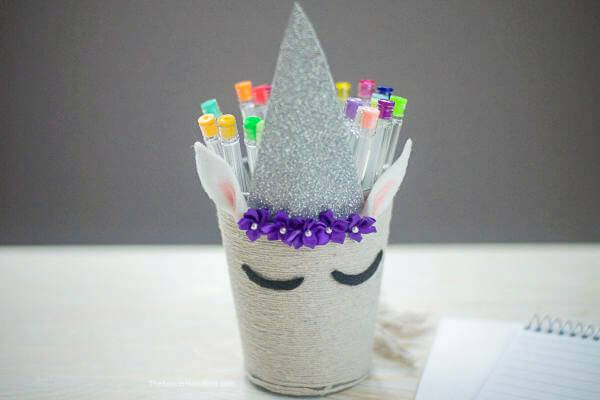 Check out this super cute DIY Unicorn Pencil Holder craft! This post contains affiliate links for your convenience in re-creating this recipe; disclosure policy here. Note: I didn’t use exact measurements for this recipe, so you can adjust to make as much or as little as you’d like. Simply keep a 3-to-1 ratio of cornstarch to frosting. 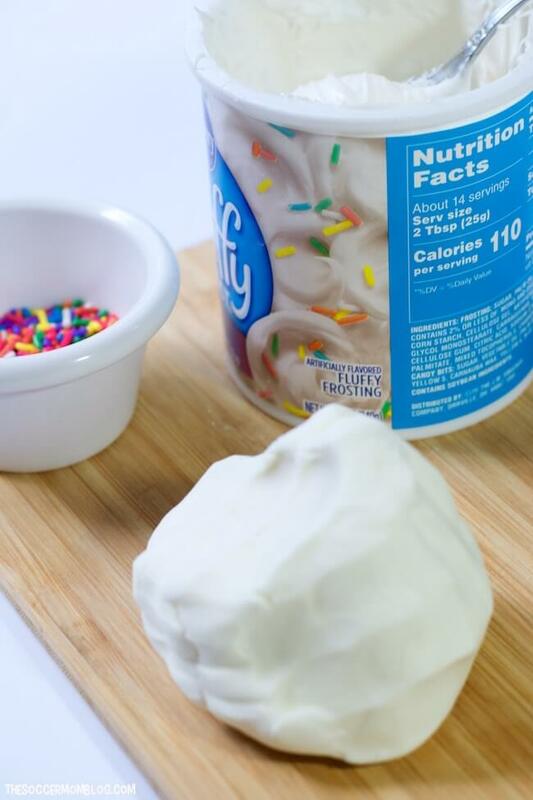 We started with our super-soft, heavenly-smelling Cake Batter Edible Play Dough (CLICK HERE for the recipe). 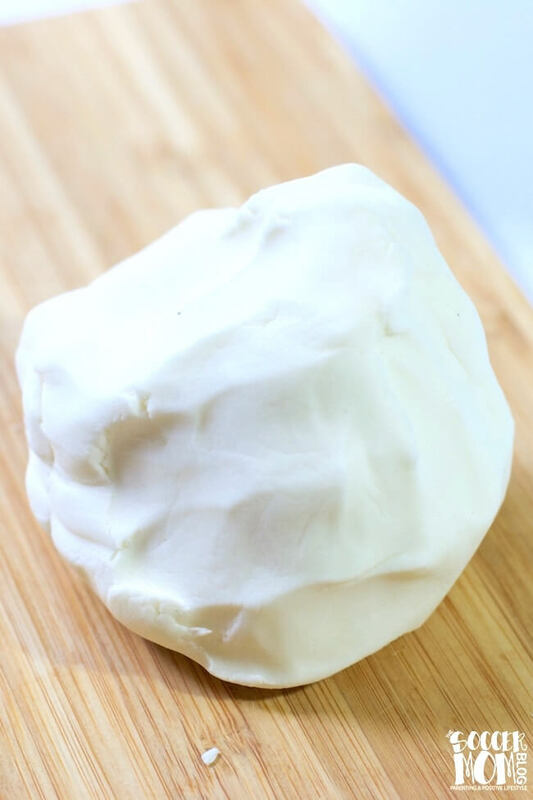 You could use any white play dough, but we love our delicious recipe! Tip: While mixing your dough, continue adding cornstarch a spoonful at a time until you have a soft, moldable ball of dough that does not stick to hands. 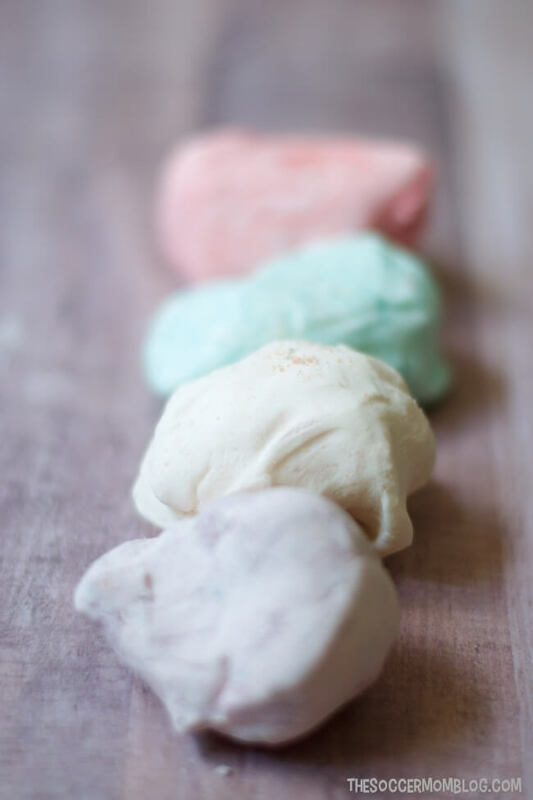 Break your dough into smaller chunks, one ball of dough for each flavor of Jello you’re using. Each of our chunks were about the size of a gold ball. Add about 1 tablespoon of Jello to each ball of dough, kneading by hand until color is evenly distributed. (If your chunks of dough are larger, you might want to add more Jello to ensure a vibrant shade). Once all of your balls of dough are colored, put them all together and knead into one large ball of dough. The colors will swirl around for a neat-o rainbow effect. Now add sprinkles for even more color! If dough begins to dry out while kids are playing, simply fold in a few drops of water to soften. Even though this dough is edible, you probably don’t want anyone to eat a whole bunch of it. Always supervise young children while they play. Since this dough is made from food ingredients, you may want to discard after a day of play and make a fresh batch next time. Don’t miss: Click here for our Master List of Edible Slime Recipes!